Lower back pain can be the worst. 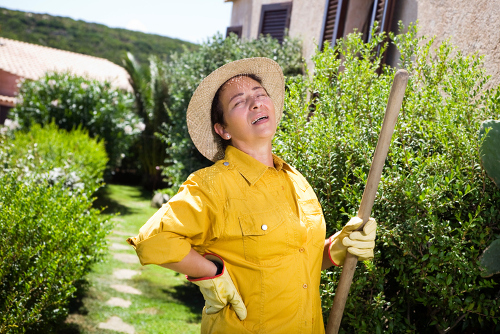 Because it’s such a central part of the body, when your back hurts, it can affect everything. It can make it hard to walk, hard to sit, and hard to lay down. It can become a pain to do something as simple as tying your shoes. Having lower right back pain is no exception to this, but it’s very specific. What causes lower back pain on the right side? Why is the cause only hurting the right side and not the left? In this article, you will find some of the causes of lower back pain on the right side, what lower back pain treatment might work for it, and how to get back on with your life. Part of the problem of dealing with lower right back pain is there can be so many reasons as to why you have low back pain. It can be something as simple as muscle strain, or something as complicated as a degenerative disc. That being said, we’ve compiled a list of the more common reasons you may have lower right back pain. The most prominent of all the causes of lower right back pain and back pain, in general, is a muscle strain. Muscle strain can be caused by several different ways. Lifting something and you weren’t in the correct stance to lift is a common way. You may have also just moved the wrong way or quickly moved in a way that did not agree with your muscles. This is a big one and not incredibly common, but it is something to keep an eye out for. Degenerative disc disease is what happens when discs in the lumbar region begin to break down. It usually doesn’t begin to manifest itself until someone is in their twenties. When those discs begin to break down, it can start as a simple ache, and then eventually reach staggering pain. When you have back pain and you consider what might be causing it, internal organs usually get forgotten. The kidneys are located right near the spine area, and when they have issues, it can sometimes cause low back pain. Kidney issues that can affect the back include things like a kidney infection or kidney stones. Another cause of pain from the spine can be osteomyolitis. Simply put, it’s a bone infection and a nasty one to boot. Osteomyolitis in adults can be caused by a form of streptococcus, a staph infection, or a bacterial infection. 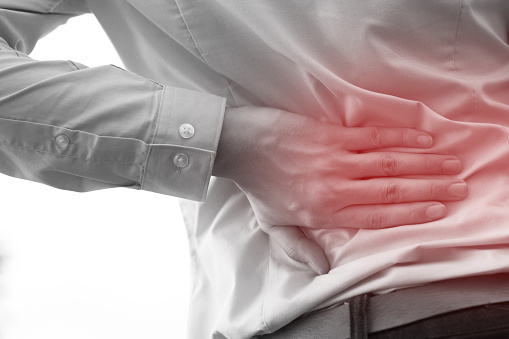 A herniated lumbar disc is when the harder outer ring of a lumbar disc cracks to the point where the gel-like material that makes up the disc starts to leak through the crack. This can cause anything from pain to horrible pain, to loss of control of the bowels and the lower portion of the body. It all depends on which disc ruptures and where the disc slips. This can be caused by lifting something too heavy for the spine to handle, not lifting properly, or as part of degenerative disc disease. The sciatic nerve is located at the back of the legs. That nerve can be compressed and cause severe pain that can run from the lower back down the leg—the length of the sciatic nerve. Beyond the reasons above, there are several other reasons why you may have lower right back pain. Sacroiliac joint dysfunction, Quadratus lumborum muscle trigger points, and even some cancers. How to Treat Lower Back Pain Naturally? If you are suffering from lower back pain, or lower right back pain in particular, there are a number of natural ways that can be used to treat that pain and possibly the cause itself. Before we begin, please note, if you are suffering from lower back pain and/or lower right back pain, we suggest you speak with a doctor for a diagnosis first. While these natural solutions may work for you, it’s best to know what the issue is so you can use the correct treatment. Furthermore, if it’s something like cancer or degenerative disc disease, you will need professional care as opposed to treating it yourself. It seems so obvious, but with how busy life is, a lot of people may ignore this recommendation. For a lot of lower back pain, the easiest natural solution is to rest your back. Don’t lift anything heavy for a day or two, and try to limit back movement. Get comfortable and read a book or binge on a TV show. This can allow your back muscles to relax and repair any damage that may have taken place. However, you don’t want to rest for more than a day or two. 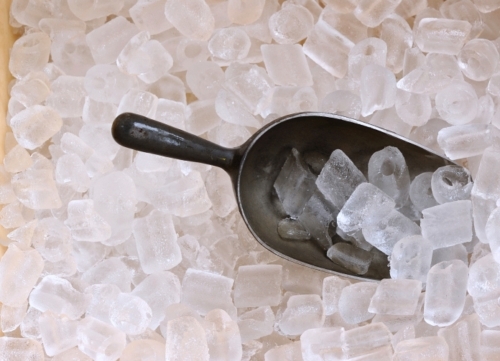 In conjunction with rest, icing the painful area can sometimes help. Icing can reduce blood flow to the area that you are icing, and reduce swelling in the area. It can also confuse pain receptors in the back, and dull the pain while it is in recovery. The best course of action is to ice in 20-minute sessions. Do not put ice or ice packs directly onto your skin—wrap it in a towel to avoid frostbite. After resting your back for a few days, light exercise and stretching can actually be beneficial. It can help loosen up muscles and keep them in working order. Avoid doing the activity or movements that may have caused the injury in the first place. Also, take care doing lower back pain exercise, if it begins to hurt, stop. Once again, these are more for the muscle issues and less for slipped discs and diseases. If you find that none of these are working for you, consult a doctor, as it’s probably a sign that your lower back issues are more than just strained muscles. Lower right back pain and lower back pain, in general, can be treated in a natural way through ice, stretching, and rest. But if there is a possibility of it being something beyond a stretched or torn muscle, talk to a doctor. The more serious issues may involve something as simple as more bed rest, to the more serious like surgery.